Hello! This is my first blog post, so it’s quite simple. I’m making a card for a dear friend’s birthday. I wanted to include something fun and creative inside. 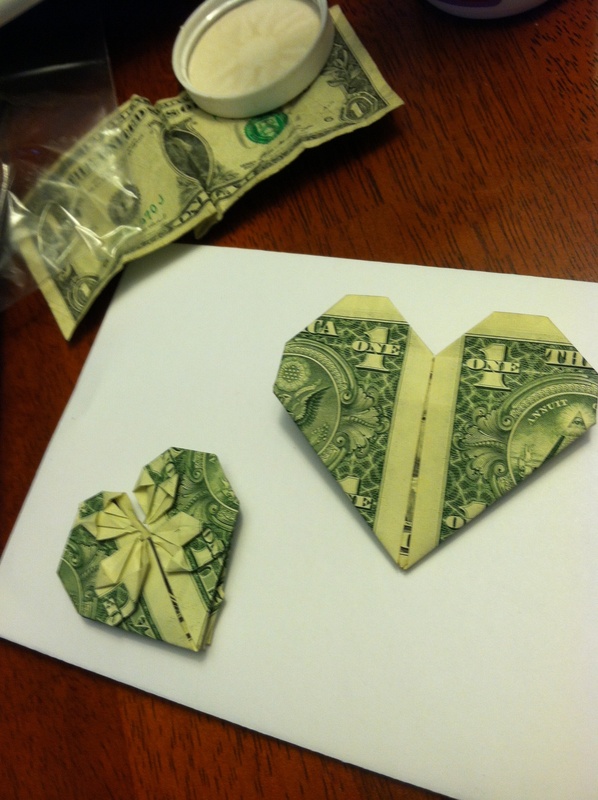 I’d saved a tutorial for an origami heart on Pinterest, and I thought that would be perfect. I found the heart I wanted, I knew if I worked for it, I could have it and it would be perfect, and I would give it away. I pulled up the tutorial, found a crisp dollar bill and set out to work. It seemed like it would be super easy – the tutorial had step by step instructions with photographs and an accompanying video. I decided to use the steps and consult the video if I got stuck. However, the steps and the video weren’t consistent. My project didn’t resemble the heart in the video or in the photographs. I tried turning it upside down and sideways, reviewing the video over and over, rereading the steps. It just wasn’t working. It seemed so easy, I had everything I needed, including confidence. I really thought I was doing everything right, but I ended up with a failed heart. I gave up. I found a better tutorial for a simpler heart. In this video, the man was actually describing what he was doing as he was doing it. 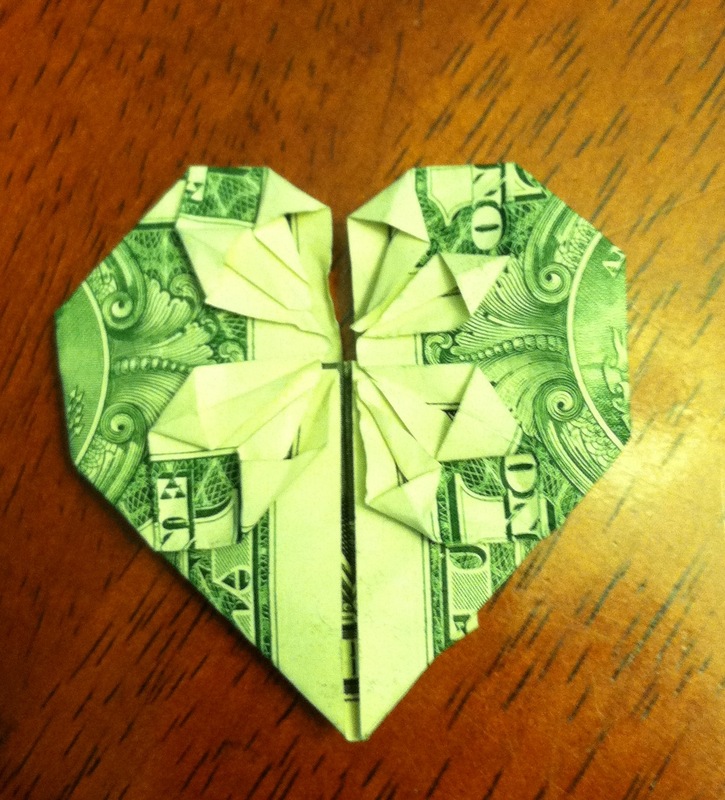 I ended up with a heart out of paper – which was the goal – but it was just so simple. I turned my back on the heart I wanted. I decided I wasn’t worthy of making it work, that it just wasn’t meant for me. I looked for, and easily found, something else that met the need, but it wasn’t at all what I wanted. I was settling. Determined, I grabbed another dollar and attempted the first tutorial again. I used a combination of the step-by-step instructions and the video. With a bit of skill and luck and lessons learned, I ended up with the heart I wanted. I’ll mail both of them inside the birthday card. One complex, one simple, both different but neither wrong. I won’t settle for anything less than true love. About me: Lover of harmony, of being kind, of knowing/celebrating who you are, of music, and musicians. Mom of awesome twin boys men. In to lucid dreaming, writing and cruelty free food. Great first post Jules, you’re a natural blogger!